Jared Walker hadn't yet visited the hit column in the California League postseason. His first playoff knock more than made up for it. After drawing a bases-loaded walk earlier in the contest, the Dodgers prospect smacked a go-ahead solo homer in the ninth inning to give Rancho Cucamonga a 5-4 win over Visalia in Game 1 of the best-of-5 California League Finals on Tuesday at Recreation Park. "Big confidence, man," Walker said of taking the opener on the road. "This is the best group I've ever been around and we're going to go really far through this. We're going to get it. We're going to make sure we take care of business, and the confidence is going to stay up no matter what." 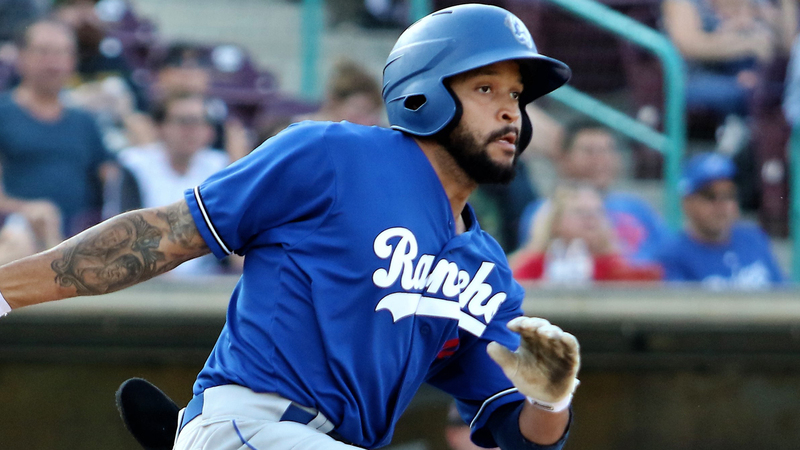 The Quakes found themselves in an early hole after Visalia plated three runs in the second inning, sparked by a leadoff homer from fifth-ranked D-backs prospect Daulton Varsho. Rancho Cucamonga struggled to get a bead on Rawhide starter Riley Smith, who held the visitors hitless through four innings. Things turned around in the fifth. After No. 16 Dodgers prospect Connor Wong singled to right and 24th-ranked Cristian Santana singled to left, Nick Yarnall followed three batters later with a game-tying homer to left. The Quakes loaded the bases with one out in the sixth and Walker worked a walk to put his team in front for the first time. "I have to give it to [Smith], he's a pretty decent starter," Walker said. "We faced a lot of the JetHawks pitchers [in the semifinals] and a lot of them are craft pitchers. They try to pitch around you and nibble, nibble, nibble; they don't try to pound you with fastballs. This guy tonight was the total opposite, and we haven't seen a guy like this in a while. It took us a minute. "He's going to try to throw that fastball as much as he can, but once we got used to that again, we're great hitters on this team. We can adjust during a game and still get the win on it." D-backs No. 9 prospect Drew Ellis belted a solo homer to pull Visalia even in the seventh, setting the stage for Walker's heroics for the ninth. "We went down three, kept battling, got some hits there in the fifth inning and sixth inning, got some hits going, the big home run and another couple hits. We got the bases loaded and got the big walk there to go up [in the sixth]," the 22-year-old said. "They went back to tie it and it's the ninth inning and we're like, 'All right, let's not let it go [any] longer. Let's put up one run.'" With one out, Walker was ahead in the count against reliever Matt Brill when he came through. "It was the first hit of my playoffs, and I've played every game so far," he said. "I've had a lot of walks so far, but it felt good. It was 2-0. Guy throws 96-98. I was looking for something elevated, up for 2-0, and he threw it. "I wanted to jump up and down and scream more, but I'm more of the nonchalant, relaxed guy that takes care of business. I knew I did that, and it felt good. It was a really good feeling. Seeing the dugout hyped me up." Despite their slow start at the plate, the Quakes never wavered, according to their second baseman. "We all stayed positive," Walker said. "We knew our 'pen was strong and [starting pitcher Leo Crawford] is going to throw them off their rhythm. They might get one inning like they did today, but other than that, we knew he was going to lock in and give us a long stretch of innings. He did, and we believe in our bullpen. We've got a strong bullpen. [Parker Curry] is a really good player to come in multiple innings and get a lot of strikeouts. To have [Dan Jagiello] to close it, it was big. We weigh on them. They pick it up and we get it going." Curry (1-0) fanned five over two innings for the win, allowing a run on two hits. Jagiello struck out the side in the ninth for his second postseason save. Game 2 is Wednesday night in Visalia.